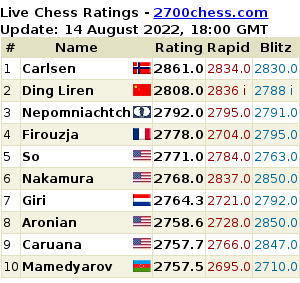 Meanwhile, Fabiano Caruana and Hikaru Nakamura won their respective games in Round 11, but they were not enough to even put them in contention for the title. Nakamura won against Varuzhan Akobian, the latter being one of the 3 co-leaders before the final round. Alexander Onischuk drew his game as well against Gata Kamsky, and thus shared the first place with Wesley So. Replay all games played in US Chess Championship 2017. Having two players tied in first place at the end of 11 rounds, there needs to be a playoff round to break the tie and determine who brings home the US Chess Championship 2017 title. By US Chess Championship standard, the tie will be broken with a two-game rapid match (G/25+5). If the contest is still undecided, the match will be decided by an Armageddon Game. An Armageddon Game is defined as a game with base time of 45 minutes for each Player. Black will have draw odds. Each Player shall bid an amount of time (minutes and seconds, a number equal to or less than 45:00) with which they are willing to play in order to choose their color. The Player who bids the lowest amount of time chooses his color and begins with that amount of time; the other Player receives 45:00. If both Players bid exactly the same amount of time, the Chief Arbiter will flip a coin to determine who shall choose their color. Playoff games begin 10 April 2017 at 13:00 UTC -5. Go weSley. Kaya mo yan. Believe in yourself. Blame it to lack of support. Wesley So is the winner of the 2017 US Chess Championship.